The IOS Press Rehabilitation & Assistive Technology Journals Collection features a portfolio of international, rigorously peer-reviewed journals focusing on physical medicine, rehabilitation and assistive technology to restore function in patients and improve quality of life. They are dedicated to advancing research, developing more effective treatment options, increasing accessibility and improving outcomes for patients with disabling conditions. You or your library can choose to subscribe to the entire collection, individual journals or purchase on a per-article basis. Unlimited online access to the Rehabilitation & Assistive Technology Journals Collection for up to three months. Contact your librarian about setting up a trial. Established over 25 years ago – read all about the 2017 NRE 25th anniversary here – the journal provides scientifically based, practical information relevant to all aspects of neurologic rehabilitation and the full life span and range of neurological disabilities including stroke, spinal cord injury, traumatic brain injury, neuromuscular disease and other neurological disorders. This peer-reviewed journal publishes papers relating the plasticity and response of the nervous system to accidental or experimental injuries and their interventions, transplantation, neurodegenerative disorders and experimental strategies to improve regeneration or functional recovery and rehabilitation. Designed to parallel the multidisciplinary team approach of caring for a child with an acute or chronic disease, this peer-reviewed journal has a broad scope including cerebral palsy, traumatic brain injury, spinal cord injury, spina-bifida, amputation, muscular dystrophies of all types, stroke, cancer, mental retardation, developmental delays, complex care and transition. Each issue features practical patient care information provided from a range of health care providers including physical medicine, orthopedic surgery, rheumatology, neurosurgery, physical therapy, radiology, osteopathy, chiropractic and nursing on topics ranging from chronic pain to sports medicine. This international peer-reviewed journal is devoted to the study of theoretical and applied aspects of human muscle performance. Since isokinetic dynamometry constitutes the major tool in this area, the journal takes a particular interest in exploring the considerable potential of this technology. Providing an avenue for communications that spans the basic and applied areas of vestibular science, this peer-reviewed journal publishes experimental and observational studies, review papers and theoretical papers based on current knowledge of the vestibular system. Disseminating information about the major areas that constitute vocational rehabilitation, the journal covers a wide range of topics, such as long-term care and diverse disability groups. 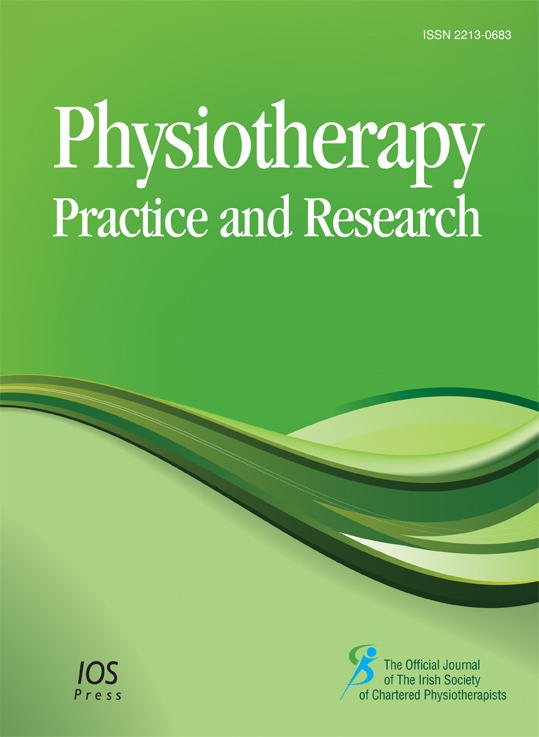 This interdisciplinary, international peer-reviewed journal publishes high quality peer-reviewed articles covering the entire scope of the occupation of work with the goals of preventing illness, injury, and disability and on assessment to design client-centered intervention, rehabilitation, treatment, or controls that use scientific evidence to support best practice. This peer-reviewed journal communicates knowledge about the field of assistive technology devices and services, within the context of the lives of end users – persons with disabilities and their family members. The journal focuses on new concepts, procedures and devices associated with the use of technology in medical research and clinical practice and the significance of medical technology and informatics for healthcare. This international, interdisciplinary peer-reviewed journal covers a wide range of topics, including engineering as applied to improving diagnosis, therapy, and prevention of disease and injury, and better substitutes for damaged or disabled human organs and studies of biomaterial interactions with the human body, bio-compatibility, interfacial and interaction problems. This international, interdisciplinary peer-reviewed journal aims to advance physiotherapy practice and research through scholarly publication. The journal has a clinical focus and publishes material that will improve the evidence base for physiotherapy and assist physiotherapists in the management of their patients.